Meshomasic is a secret giant. At first glance it is an empty woodland traversed by a few lonely gravel roads but a closer look reveals every level of mountain biking on both singletracks and doubletracks, all in a location that's convenient to many. Located at the center of the state, Meshomasic has the honor of being Connecticut's, and New England's, first state forest. 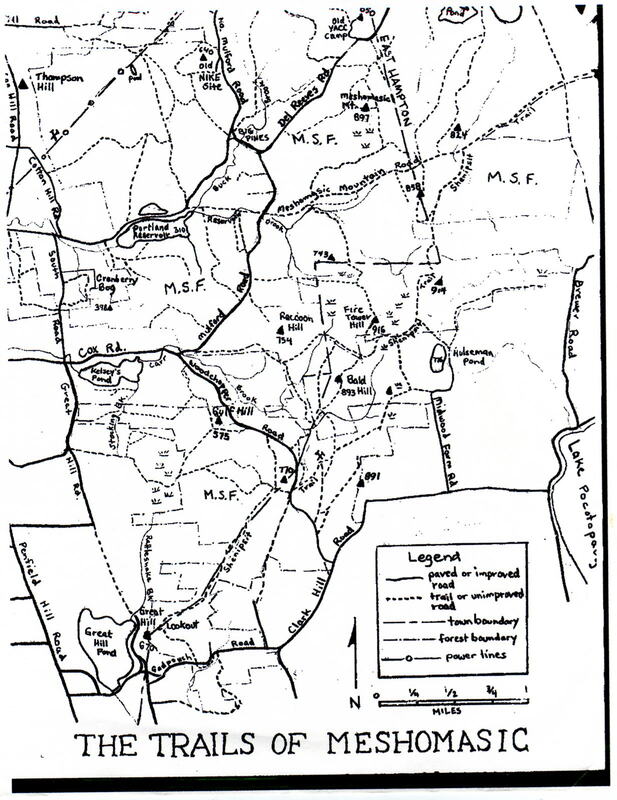 It was established in 1903 with the purchase of 355 acres in Portland (at a price of about $1.75/acre) and has since grown into the neighboring town of East Hampton to its current size of nearly 8,000 acres. Today the forest remains in an undeveloped state, free of the pavement, facilities, and visitation that are present at other public lands in central Connecticut. This creates excellent wildlife habitat and attracts a healthy following of hunters, especially in late fall when deer season is underway. Mountain biking is discouraged at Meshomasic during this period except on Sundays, when hunting is prohibited by law. Mountain biking is permitted on all trails at Meshomasic except the singletrack segments of the blue- blazed Shenipsit Trail. A long-distance hiking route, the 33- mile Shenipsit traverses the state forest on its northward course to Shenipsit State Forest near the Massachusetts border. Fortunately, plenty of other singletracks and miles of old doubletracks await for mountain biking. Cyclists are reminded that the forest's hilly, narrow, and winding gravel roads are open to cars, although the traffic level is quite low. Keep to the right and be ready to share the road at all times. Visitors are asked not to block trailhead gates when parking since work crews and emergency vehicles always need access. The area is open only during daylight hours. Signs mark a few of the gravel roads but none are present on the trails so bring a map and follow it closely. Mountain bikers should also be equipped with bike tools and plenty of drinking water as Meshomasic is relatively large and remote compared with other nearby parks. No parking lot exists but the roomiest roadside parking area is designated on the accompanying map at the intersection of Del Reeves Rd., North Milford Rd., and Old Marlborough Tpke. Smaller spots exist at many other trail/road intersections. The miles of dirt roads have the forest's smoothest surfaces but they encounter plenty of big hills, making them strenuous to ride. One of the longest options, Del Reeves Rd. originates at the parking area with a climb at the base of Meshomasic Mountain that gains about 400' in elevation and lasts for over a mile. At this point it heads downward for most of the remaining 1.7 miles to Mott Hill Rd. at the Glastonbury town line, passing a scenic pond along the way. Milford Rd. is the forest's main drag. It begins at Del Reeves Road near the parking area and heads southward along a rolling course through a landscape of rock-strewn slopes. Milford Rd. ends after 1.7 miles at the bottom of a hill where Wood Chopper's Rd. intersects on the left and continues the ride to the southeast. Wood Chopper's begins with a 1.7-mile uphill that is steep for the first quarter-mile and eventually finishes with a 0.3-mile downhill run to dark Hill Rd., with a few flat spots providing restful interludes along the way. Curvy and narrow, the road is cut into the rocky slopes of Gulf Hill. Other options include North Milford Rd., a 1.2-mile uphill ride to the state forest boundary at a set of powerlines, and Old Marlborough Tpke., a paved road past Portland Reservoir that is gated and closed to vehicles. The main trail at Meshomasic is Reservoir Rd., or Portland Reservoir Rd. as it is known at its East Hampton end. One of the forest's oldest, it stretches for 3.5 miles across the center of the property from Portland Reservoir to White Birch Rd., spanning numerous hills deep in the woods and providing a spine for many other trails. Time has taken its toll on the road's surface and mountain bikers should expect a difficult ride at many points due to eroded inclines and several stream crossings. Beginning at the western end, Reservoir Rd. leaves the water's edge and crosses Milford Rd. at the half-mile mark after climbing a rocky slope. More eroded hills await east of Milford Rd. and will test even the nimblest riders with treacherous, rock-infested inclines. After gaining about 400 feet in elevation in the first 1.5 miles, the uphill grind mellows and conditions moderate for the remaining distance to White Birch Rd., with lots of downhill in the last half-mile. The blue-blazed Shenipsit Tr. passes through Meshomasic with a few miles of intermediate-level riding, overlapping Portland Reservoir Rd. for part of this distance. Mudholes and a few eroded slopes are the predominant obstacles for bikers. The trail is closed to biking where it reduces to singletrack between two high points in the Bald Hill Range but cyclists can continue westward from this point on a forest road that descends for more than a mile to Milford Rd. with a series of washed-out drops. Mott Hill Rd. has a variety of conditions. With its southern endpoint open to cars, the road rises past several homes and then enters the woods as a trail that is hindered only by several broad puddles. The course is generally flat for the next half-mile until it crosses Portland Reservoir Rd. where a 0.8-mile descent drops riders 300 feet in elevation on a severely washed-out route. The trail reduces to single- track at a few points where the erosion forced re-routing. Mott Hill Rd. continues to descend from this point for another 0.7 miles to Dickinson Rd. in Glastonbury. One of the state forest's highest points, Meshomasic Mountain offers no view but provides three doubletrack routes to the summit. The most difficult option is a rugged jeep road aligned in the east-west direction from Del Reeves Rd., while a second trail originating from Del Reeves heads south to the summit with a flatter profile and intermediate- level conditions. The third route to the top connects Reservoir Rd. with several moderate slopes and one particularly rocky spot. The doubletrack trail along the powerline corridor has some big hills and a surprisingly firm surface for the first 1.5 miles, then it reduces to singletrack and hits some eroded slopes. The trail intersecting at its midpoint has intermediate conditions with milder hills and a scattering of obstacles. Some of the best singletracks lie north of the parking area between North Milford and Del Reeves roads. Follow the doubletrack trail that starts at the intersection of these roads and ride north along Buck Brook. After two stream crossings, the trail rises on a slope and then forks at the start of a 2.5-mile loop that is best ridden in the clockwise direction. Stream crossings, rocky spots, steep inclines, and other hindrances slow the pedaling at numerous points but much of this loop is wonderfully smooth and curvy. The yellow-blazed trail forms the northern leg of this loop and then continues across Del Reeves Rd. and up Meshomasic Mountain. From the top, it descends southward on another singletrack for a mile to Reservoir Rd. The first half has a gradual downward tilt with a smooth treadway and the second half descends at a quicker pace with a bumpier surface and culminates with an abrupt drop over slabs of ledge. Crossing Reservoir Rd. and a parallel stream, riders can continue southward on a challenging doubletrack section of the yellow-blazed trail which eventually narrows to singletrack as it approaches the highest point in the Bald Hill Range. Climbing steeply, the trail demands strong legs as it tops the hill near the Shenipsit Tr. More good singletrack riding awaits in the northeast corner of the forest where smooth treadways allow space for riders to steer around the obstacles. One of the longest veers off the Shenipsit on a northward course to the shore of a pond beside Del Reeves Rd. at the forest's northern boundary. It starts with a short hill climb and then crosses Reservoir Rd. and starts a long descent through several timber clear-cuts. Most of this path is an intermediate-level ride but one rocky section is more difficult. From 1-91 take Exit 22S and follow Rte. 9 south for 5.3 miles. Take exit 16 and follow signs for Rte. 66 east, crossing the Connecticut River. At the next traffic signal, continue straight on Rte. 17A north and continue for 1.5 miles to a monument on the right. Turn right on Bartlett St. at this point and drive for 1.7 miles to the end, turn left on Rose Hill Rd. and continue for 0.6 miles, then turn right on Cox's Rd. The pavement ends after 2 miles on Cox's Rd. and a third of a mile later it becomes Milford Rd. Drive for another 1.7 miles to the end, turn left on Del Reeves Rd., and look for an unmarked parking area a quarter-mile ahead on the left at the intersection of North Milford Rd.